ReaderBound brings together a range of discovery features, state-of-the-art data import routines, a dynamic e-commerce system, and an enterprise-grade content management system — and it’s easy to work with. Publishers get attractive, customizable websites that present books beautifully and effectively, engage readers, and make direct sales a snap. ReaderBound is ready out of the box — it comes complete with dozens of features you need for a great website, including field-tested templates for book listings, author profiles, events, blogs, and more. 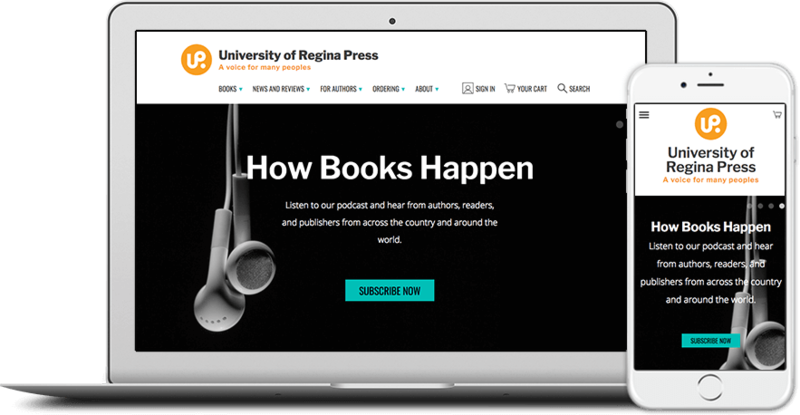 The ReaderBound team has built some of the most ambitious online databases and website platforms in Canadian book publishing. We have also, for years, been working on best practices in getting books in front of their widest possible audience online. ReaderBound websites are customized for every firm; you choose what you’d like to include from a list of components and features including event listings, media mentions, social media feeds, and more. Every ReaderBound deployment includes a dedicated design process that makes each site unique. You control variables such as colour, type, and other design elements, as well as structure, display order of content, integration of social media feeds, and sharing controls. If you’ve ever worried about the state of your bibliographic data or wondered how painful it would be to get it into a new system: worry no more. ReaderBound has incredibly robust data import routines; no more entering bibliographic data for hundreds — if not thousands — of books by hand. You can load your entire catalogue, and reload it or update it at your convenience, in minutes. Finely tuned interface elements allow readers to browse your books and easily discover new authors and titles. ReaderBound allows you to quickly create custom lists and title selections, and many of the page templates include automated title selections to encourage further browsing. ReaderBound’s powerful e-commerce system makes selling direct a breeze. Apply discounts to one book, some books, or all of them. Create bundles. Process payments securely. Fulfill e-book orders on the spot. ReaderBound will even print you mailing labels and packing slips on the fly for print orders. Selling directly is one way to connect with readers but there are others that are just as important. ReaderBound makes ample space for strong calls-to-action that encourage readers to opt in with their email addresses. Your mailing list gets a whole new life and you get a direct pipeline to readers who are already interested in what you’re doing. The ReaderBound interface is entirely responsive and automatically adjusts to the full range of desktop and mobile devices. You can meet readers wherever they are: at home, in the office, or on the go.